Do you qualify for debt relief? Talk to an IAPDA Certified and Accredited Debt Counselor for a FREE CONSULTATION at (866) 376-9846. During your consultation, the debt counselor will go over each of your options. You have multiple options to choose from to quickly get out of debt. Options include consumer credit counseling, debt validation, and debt negotiation. Golden Financial Services is Accredited by the International Association of Professional Debt Arbitrators (click to verify), A+ Better Business Bureau Rated (click to verify A+) & the Top Rated Debt Relief Company in 2017 by Trusted Company Reviews (click to verify #1 Ranking). When a debt consolidation company is BBB Accredited, they have high standards that must be maintained. Firstly, during the initial accreditation approval phase, the BBB checks everything from the company’s client agreements–to their web pages; ensuring there are no misleading sales tactics in place and that the company’s program is compliant with laws. The BBB takes their time during this phase; it can often take more than two months for them to finish reviewing a debt relief company’s history, material, websites and much more. So once the BBB gives a company the green light to get their accreditation, a company needs to maintain the best possible business practices and a small number of complaints. A BBB accreditation membership can be revoked just as easy as it can be approved if the company is not doing business the right way. The BBB is not biased, and they operate fairly. The BBB does NOT require a company to purchase their accreditation membership to get an A+ rating. Golden Financial Services is proof of that. Golden Financial Services is A+ rated at the Better Business Bureau and we are not accredited. Debt consolidation companies are often BBB accredited and don’t have an A+ rating. To get an A+ BBB rating, a debt relief company must fulfill a long list of requirements, making an A+ rating something that doesn’t come easy. Is Golden Financial Services a BBB Accredited Debt Relief, Settlement and Consolidation Company? At Golden Financial Services as of 09/13/2018, WE are A+ rated by the San Diego BBB (with ZERO debt relief, settlement & consolidation program customer complaints). We are not a BBB accredited company, but we do maintain an A+ rating. We don’t believe that by paying for the BBB membership, it’s going to make us appear more reputable, but we do work extremely hard to maintain that A+ rating. When a person is deep in debt that’s a sensitive subject. Just because someone has debt doesn’t mean they did anything wrong. Unexpected expenses are just that, unexpected! The dog needs to go to the vet. The cost of gasoline goes up. Interest rates rise. Things happen! And our job is to address debt when it becomes unmanageable for a person. We’re able to personalize a plan that’s feasible and allows people to get out of debt with ease. We don’t offer just one plan and try to squeeze everyone into that one plan like most of the debt settlement companies are doing, we offer multiple options. That is how we’re able to keep such happy clients, we put them in the right program and actually get them out of debt! Call 1-866-376-9846 to Learn About Our Programs and What Sets us Apart. Debt consolidation and debt settlement companies, and debt relief law firms need to work hard to maintain an A+ rating and their accreditation status. Therefore, a large majority of debt relief, settlement and consolidation companies are poorly rated at the BBB. A company’s rating will go down if a company has unresponded complaints and if they don’t operate with honest and ethical business practices. What is the best debt consolidation company or most reputable debt settlement company to use? Besides checking a company’s letter rating and accreditation status at the Better Business Bureau website, you can also use the following factors to determine if a company is reputable or not. A. How long has the company been in business and offering debt relief services? If they have more than ten-years in business, like here at Golden Financial Services, this usually equals experience! B. Do they have any unresolved BBB complaints? If a company has unresolved BBB complaints, this means that they did not respond to a BBB complaint in a satisfactory manner, according to the BBB. This is a very bad sign. C. Does a debt relief company charge up-front fees? Debt settlement companies are not allowed to charge up-front fees according to federal laws. Reputable debt settlement companies will charge a performance fee after your account is settled and paid off. D. Is there an assurance of performance or guarantee included with the debt relief program? There is nothing worse than a debt relief company that doesn’t perform and still charges the consumer a fee. E. Does the company have positive online reviews? It is very easy to look for debt relief companies online that have positive reviews. If a company has lots of positive reviews and testimonials at sites like Yelp, Google Plus, Ekomi, well this is a positive sign. If they have negative reviews all over the internet, this would be an indication illustrating that you may want to search for another company. Just be careful and always look at the source of the review, and obviously, if the reviews are on that company’s website, well these are controlled reviews that may be fake. F. Did they disclose the negatives and positives to you? Debt relief programs offer excellent benefits including saving money, getting out of debt quickly and having only one comfortable monthly payment. However negative consequences could also occur after joining in a debt relief service. This is why it is extremely important to only work with a reputable debt relief company that understands the negatives, and how to deal with each situation if it occurs. A trustworthy debt settlement company will disclose the negatives and positives to you, ensuring that you fully understand the program before joining. If a company offers you a program to help you with your unsecured bills, and it sounds too good to be true, it probably is too good to be true. This next page breaks down the pros & cons of each debt relief program so that you can understand each program’s benefits verse the negatives. Did you ever hear someone say that you can “pay for your “A” with the BBB”? Let us tell you the truth, that’s a lie! Just to reiterate and summarize what we talked about above; BBB accredited debt settlement companies and BBB accredited debt consolidation companies do pay to be accredited,–but not for an “A” rating with the BBB. GFS is not accredited, so to have a good rating with the BBB, we must work real hard for it. Let us help you find a debt relief solution and to achieve your financial goals. Learn all of your debt relief options by calling 1-866-376-9846 today. Let us help you — like we’ve helped thousands of other consumers with becoming debt free. 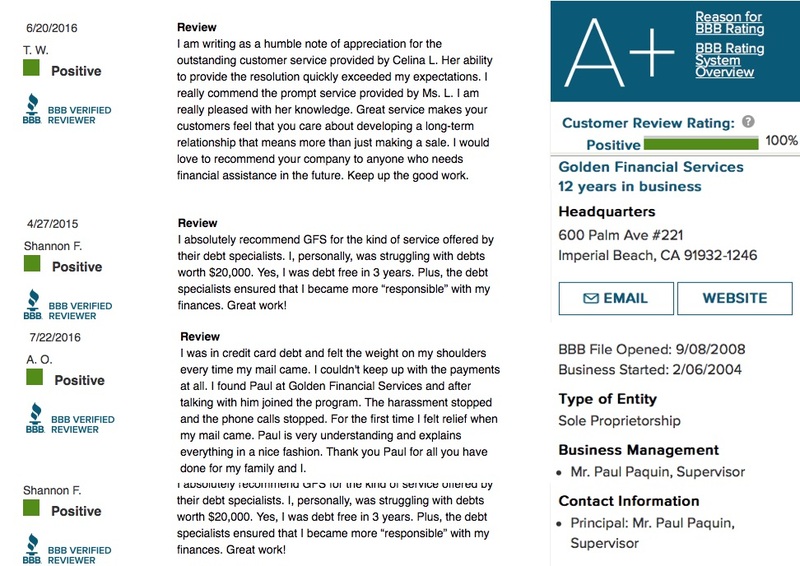 A+BBB rated & 13+ years in business — providing debt relief, settlement and consolidation options.